With Holi around the corner, it is time to roll up your sleeves and toss up for our own yummy delicacies Mutton from Nagpur ” Saoji Mutton”.It is a famous mutton curry from Nagpur.Sometimes back we had tasted this dish,we liked very much. 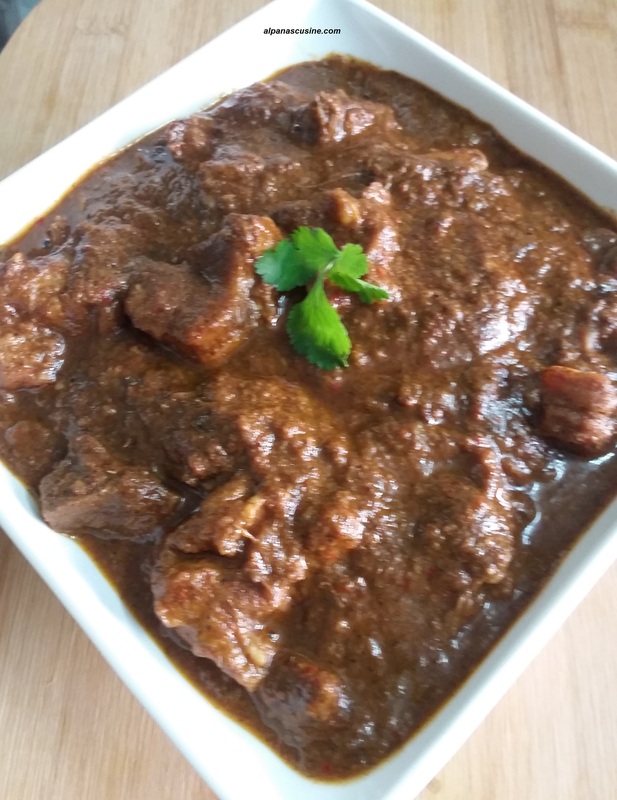 After eating this dish ,we find that,Saoji mutton has very different taste with hot ,spicy and exotic flavour.We have tried out at home and it turned out to be awesome. Clean and wash the mutton.In a bowl marinate mutton with salt and turmeric and keep for an hour. To make spice paste,heat the oil in a pan and fry the sliced onion till they become golden brown.Drain from the oil and let it be cool down ,then make a fine paste of fried onion. In the same pan add all the remaining spices except coconut and roast till nice aroma come out.Remove and keep aside.In the same pan add the ground coconut till light golden,then remove from the heat.Now make a fine paste of all the fried spices by adding some water. You can boil mutton in SAlt water before adding the spices,But I had used mutton directly without Boiling. Now take the pressure cooker ,heat the remaining oil,add the ginger+garlic paste and saute for 2/3 minutes .Add the onion and saute for another 2 minutes.Now add the spice paste and mix well. Now add marinated mutton and cook till spices leaves oil.Add salt and water ,mix well and close the cooker.When 1 whistle come out on high heat ,then slow the flame and after 10 minutes turn off the gas.